Katie Holzmann was born in 1988 and grew up in the Pacific Northwest. 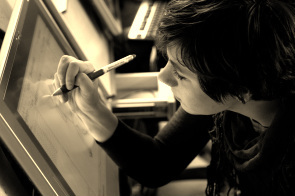 She learned to speak french in the town of Parthenay, France and studied at Rocky Mountain College of Art + Design in Denver, CO earning a BFA in Animation. She currently lives in Portland, OR and enjoys cooking, reading fashion blogs and Japanese comics online, and constantly making baby-talk to her cat, Mia.